A girl loves Indian food. Have you ever shied away from cooking or eating Indian cuisine because of the mile-long ingredients list? The spices used in cooking have health benefits; they add nutrients and an exotic kaleidoscope of flavor to dishes witnhout packing on fat or calories. 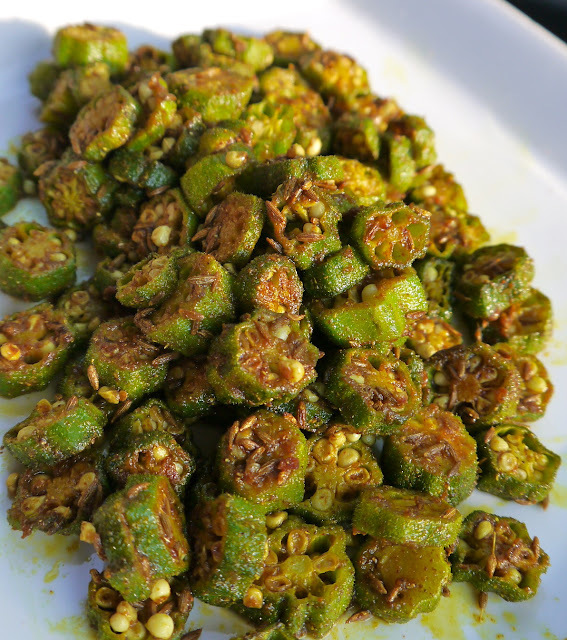 Spicy Okra (bhinidi) is a great dish for Meatless Monday or add as a side dish to spice up a grilled chicken. Make sure to completely pat dry the okra before cutting. Heat ghee or oil in a pan on medium high heat. Test the temperature by adding a cumin seed to ghee or oil, if it cracks and pops you can proceed to add the rest of the cumin seeds. When cumin seeds crack, you can add the okra. Reduce the heat and stir the okra for about 3 minutes. Add remaining ingredients and cook for about 2 minutes. Enjoy!